One of this country's most astute commentators in any medium, Loudon Wainwright III has been sharing his superb songs with us since the late '60s. 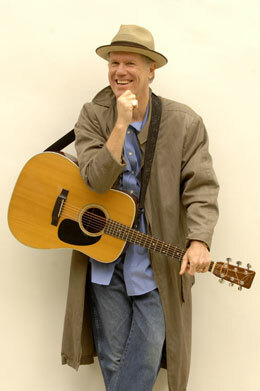 A superb lyricist who balances the unflinching honesty and powerful emotions of his autobiographical musings with a knack for pulling the rug out from under his own pretensions, Loudon "wrings more human truth out of his contradiction than any other songwriter of his generation," in the words of New York Times music critic Stephen Holden. The veteran singer-songwriter's most recent CD, High Wide & Handsome: The Charlie Poole Project, recently won a 2010 Grammy award for Best Traditional Folk Album. In addition to his music, you probably know Loudon's face from the airwaves—he's acted on numerous television programs, from MASH to Parks & Recreation—or from the silver screen, where he appeared Tim Burton's Big Fish and Judd Apatow's The 40 Year Old Virgin and Knocked Up, to name but a few.